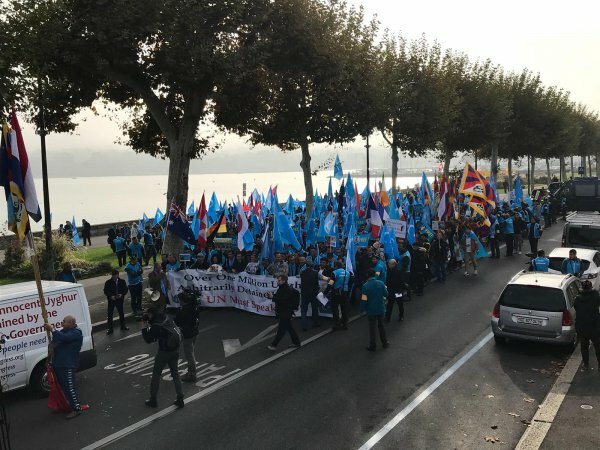 In the morning of 6 November 2018, the Unrepresented Nations and Peoples Organization (UNPO), the World Uyghur Congress (WUC) and the Society for Threatened People (STP) have jointly organized a protest to highlight the severe human rights situation in Southern Mongolia and in Tibet as well as the mass arbitrary detention of the Uyghur people by Chinese authorities in internment camps. Protesters met in front of Palais Wilson at 9 am and marched at 10 am to the Broken Chair, where a static demonstration was held from 11 am to 13 pm, which counted with speeches from the civil society as well as other leaders, who shared a common concern regarding human rights violations in China. Having taken place on the occasion of China’s 3rd cycle of Universal Periodic Review detailing its human rights records by the United Nations Human Rights Council, the protest has counted with about 1000 people. Despite the vast amount of evidence showing how China violates the rights of these people, only 23 out of 153 countries present during the session clearly denounced them. However, while the protest and the accusations presented during the review have demonstrated the growing opposition to China’s policies in the Xinjiang region, where more than one million ethnic Uyghurs, Kazakhs are currently being held in internment camps, China has once again rejected the criticisms in regards to its treatment of ethnic Muslims. As representatives from the United Stated, Canada, Britain, France, Germany, Switzerland, Australia, Japan, and several other countries have called on China to close the internment camps where more than one million ethnic Uyghurs and Kazakhs are currently unlawfully held in detention. Chinese representatives have responded by affirming that accusations of rights abuses from a few countries were “politically driven” and “not factual”. The country’s foreign minister, Le Yucheng, has further stated, “No country shall dictate the definition of democracy and human rights”, and “We will not accept the politically driven accusations from a few countries that are fraught with biases, with total disregard for facts”. In addition, Chinese delegates affirmed that internment centres were a preventive measure to counter terrorism. In addition, minister Le Yuncheng also affirmed: “These training centers have been welcomed by the attendees. After graduation, they can acquire one to two vocational skills and they can have good remuneration through labor by piecework wage on top of their basic wage, and they say they have received good protection. Some attendees say they were influenced by extremist thoughts and they never took part in culture and sports activities. They never thought life could be so colorful and so meaningful”. This statement sharply contrast with those of former detainees of the centres, who have described them as political indoctrination camps that force them to renounce their faith and to swear loyalty to the Communist Party. In spite of China’s efforts to deny such allegations and push forward a positive image of the camps, Human Rights Watch has highlighted that China has failed to convince a growing number of countries who are recognizing human rights abuses, questioning why people are being held against their will, and calling for the release of detained Uyghurs and other minorities from the camps. Furthermore, on 5 November 2018, the UNPO, along with other organizations like HRW and WUC has released a joint press statement that highlighted the removal of key stakeholder information by the UN Office of the High Commissioner for Human Rights (OHCHR) for consideration by the UN member states for the upcoming third Cycle Universal Periodical Review (UPR) of the People’s Republic of China. Although the OHCHR have issued a Corrigendum document on 2 November 2018 that included citations of reports previously removed, the removal of at least seven submissions from the summary stakeholder submission for China’s review, without suitable justification in the first place remains a deeply concerning issue. In light of this, the UNPO makes a call for greater transparency in the UPR stakeholder compilation process and expresses its gratitude for the growing support of several states who have called for the end of human rights abuses in China and for the release of the people detained in internment camps in Xinjiang and the respect of the human rights towards the Tibetan and Southern Mongolian people.